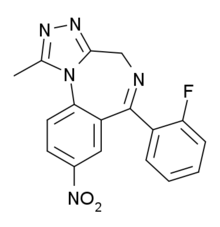 Flunitrazolam is a benzodiazepine derivative that has been sold online as a designer drug, and is a potent hypnotic and sedative drug similar to related compounds such as flunitrazepam, clonazolam and flubromazolam. It was first definitively identified and reported to the EMCDDA Early Warning System, by an analytical laboratory in Germany in October 2016, and had not been described in the scientific or patent literature before this. This page was last edited on 1 March 2019, at 10:08 (UTC).